The 8th Indigenous Peoples Art Market will commence on October 1st with a special by invitation only V.I.P. Preview. The Art Market will be FREE and open to the general public October 2nd from 11am-9pm and October 3rd from 11am-3pm. 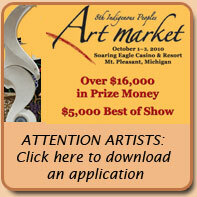 Nowhere else in Michigan will you have the opportunity to purchase artwork from such a diverse gathering of the most renowned North American Indian artisans. This year's Art Market will once again take place at the Soaring Eagle Casino and Resort's Entertainment Hall, as it provides an atmosphere and space conductive to this prestigious event. The Ziibiwing Center and the Saginaw Chippewa Indian Tribe of Michigan are extremely grateful and honored that our Exclusive Sponsor, Charles Schwab & Co. Inc., will partner with us again in support of Anishinabe artistic cultural initiatives. 2. The applicant must present documentation of at least 1/4 degree of North American Indian blood from either the Bureau of Indian Affairs or the Department of Indian Affairs. All submitted papers must be official documents of applicant's tribe/nation/agency/band. The Ziibiwing Center will verify all applications. Please contact the Sales and Events Coordinator by phone at 989-775-4744 or via email at sgriffin@sagchip.org with any questions or for more information.